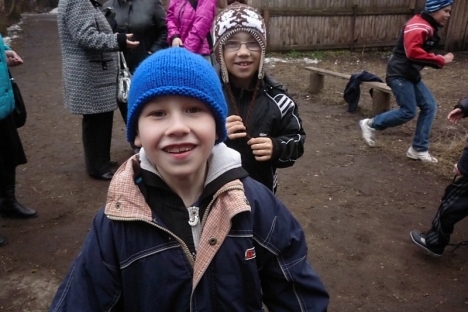 In the wake of adoption controversies, American volunteers try to improve Russian orphanages. The tragic fate of several Russian orphans in America has sharply focused the public debate, resulting in a bilateral treaty that will soon be ratified by the State Duma. At the same time, American charities have been eclipsed by the controversies. As Russia prepared to observe International Children’s Day last weekend, RBTH found an encouraging story about a young couple whose new charity gives back to Russian orphanages. Vasily Hurley, now married and living in California, was adopted by an American family in the late 1990s from a Russian orphanage located in the Kaluga region, about 100 miles outside Moscow. Vasia, as he is known, is now 27. He works for an automotive parts company and was a criminal justice major and is looking to start a career in that field. His wife, Danielle Hurley, is a research analyst for the state of California. Vasia understood very intimately the struggles that orphans faced - and still face - in a country where according to latest estimates there are more than 700,000 children who live without parents. This figure is even more shocking given the fact that after World War II, when at least 23 to 25 million Russians were killed, there were fewer orphans than there are today. Vasia and Danielle Hurley wanted to make orphanages more like a home. They have established the charity Bright Connections with a specific focus on Russian orphans and cultural awareness. Their organization was granted 501 status in March. “While Vasia was lucky to have been adopted, he knows that most children are not, and many do not have a very bright future,” Danielle told RBTH. Bright Connection volunteers travel at their own expense. The Hurleys recently returned from their trip to several orphanages in the Kirov region. The main goal was to meet with the administrators and identify the most desperate needs of the institutions. One of the orphanages badly needs renovation, as the second story floor is cracked and dangerous for children. The children in Kirov need clothing and shoes and the kids have very little to do outside and inside the facility since there is no sports equipment of any kind and a room which is supposed to be a recreation room is empty, lacking any art supplies and games. It is worth noting that while the Russian government, and specifically Chief Children's Ombudsman Pavel Astakhov, is struggling with the daunting social issues, American volunteers stress that small steps on the part of non-governmental organizations could be taken in order to expose Russian orphans to a brighter side of life. “Currently we are raising money for school and art supplies for the orphanages. We plan to be able to purchase them items such as printers, notebooks, and crayons,” Danielle said. Art supplies will obviously not fix all the problems of orphans in Russia. But it is a symbolic contribution. The Hurleys also have greater ambitions. They hope to get a mentoring program off the ground in which adopted adults would mentor children living in orphanages in Russia. Russia Beyond the Headlines: What are the main obstacles you see for your charity work with Russian orphans? Danielle Hurley: The main obstacle for the organization is the distance. While we have many interested volunteers in Russia that can be more hands on with the orphanages, people in the United States like to donate items such as clothing, toys and sports equipment. However, we have yet to find a way to get this surplus of items over to the orphans. We are hoping to find a shipping company that will sponsor shipping costs and help us to get these children more of what they need. Americans turnover their clothes and toys very quickly and are willing to donate their old items to a great cause, but getting them there is the challenge. RBTH: Do you believe that local and foreign NGOs can significantly improve quality of life for orphans in Russia? D.H.: We have been amazed at the number of people in Russia and Russians in the U.S. that have wanted to be a part of Bright Connections and we truly believe that it does not matter who is helping the orphanages, as long as somebody is. Bright Connections is based in Sacramento, California, a long way off from Russia, but with today's technology we are able to join forces with like-minded people in Russia and work together to give aid to these children. Furthermore, our volunteers enjoy working with, and learning from, volunteers from a culture outside of their own. Part of Bright Connections' mission is to expand cultural understanding between the U.S. and Eastern Europe; cultural barriers are quickly being broken down as all of our volunteers work towards the same goal of helping these orphanages. The children in these orphanages need hope. We named the organization Bright Connections because we want to make their lives brighter. The directors and staff do an amazing job with very little resources and Bright Connections' goal is to try and give them more to work with. Things like computers, printers, art supplies and sports equipment will help the children grow and develop at the same rate as children outside the orphanages. These items are small but very significant to any child. We are also researching how to best set up a mentor program to help the children prepare for life outside the orphanage. The rate of alcoholism and crime is extremely high with young adults once they leave the orphanage, and we would like to decrease that rate. RBTH: Are you planning to start doing adoptions in Russia any time soon? D.H.: We would like the organizations' focus to remain on helping the orphanages and as we grow be able to expand to help more orphanages, so we do not plan to get into any adoption services.